Getting Pushback on Your CRM Adoption? Do Technical Salespeople Need Sales Training? Why Doesn't Sales Methodology Get More Attention? Sales Execution - What Should You Pay Attention To? In a recent conversation with a CEO, we discussed his use of CRM. While his intention was to increase focus and visibility into new business development, the primary usage had become tracking client and delivery activities on large, existing projects. Little attention was paid to tracking the flow and evolution of new opportunities. In his case, significant non-sales events had diverted his attention. Because his business was driven by large long-term projects, profitability and cash flow had stayed positive. Last week, during a Sales Recruiting program, we discussed reasons why the recruiting and startup process failed to work. I asked the management team whether their CRM system tracks the internal milestones needed to do business with someone, or a sales process that leads to a prospect wanting to buy from them. After some silence, they acknowledged that it was the former. These scenarios illustrate ways in which CRM is misused and underused. While sales technology tools have grown significantly in the last several years and companies are investing in them, it is important to look at adoption, usage, and most importantly, outcomes. 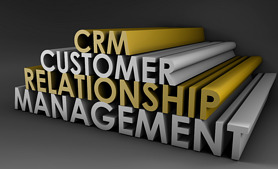 What are some of the desired outcomes of using a CRM platform? Most salespeople won’t optimize their efforts without proactive debriefing and strategy development. In virtually all cases, this requires the sales leader. Well-planned, adopted and utilized CRM is necessary for this. I reached out to our partners at Membrain, a world-class CRM tool, for their thoughts. Recently, they were named Best Sales CRM in the 2013 Top Sales Awards. Leadership adoption is critical. This doesn’t mean just talking about the virtues and critical reasons for using CRM. In the movie “We Were Soldiers”, Mel Gibson tells his troops that the paratroopers have a rule: the officer is always the first one out of the plane. If sales leadership uses the tool daily, the team will be more inclined and encouraged to do so. If the CEO uses it and makes this known, people will pay attention. However, if leadership fails to do this, the initiative will very likely fail. Many salespeople don’t make the connection between using CRM and it’s value. They see it as an unnecessary burden. Much of this derives from their often unstructured and non-detailed styles. Leadership has to work tirelessly to close this gap and show the salespeople that it’s not just a reporting tool. All efforts should go toward ensuring that it helps the sales team execute the sales strategy, follow their process, get better coaching and win more profitable and satisfied clients. It must be incredibly easy to use. When used properly, it will impact their workday tremendously. It cannot be an obstacle for the sales people. It can't be seen as stand-alone software, it needs to tie into and support the overall sales strategy, reinforce the training programs and encourage best-practice behavior. Visibility and awareness are crucial. Salespeople need to know the rules and have a clear, accurate picture of where they stand. Combining this with healthy competition helps. Spend time discussing with your team (group and individually) what the conversion ratios are, what the optimum sales cycle is, who is getting traction quickly and who’s moving opportunities through the process more consistently. Send out daily updates, based on your observations of the data. For those of you who may be interested in learning more about being an effective sales leader, our expert team at Kurlan & Associates is presenting an upcoming, complimentary webinar on February 5: "Leading Your Ideal Sales Force - Part 1" at 11:00AM Eastern Time. Please do consider registering. Implementing and improving the use of CRM systems is a high priority for most C-Level and Sales Leadership executives. Many believe, often mistakenly, that CRM ensures the consistent application of a structured sales process. The assumption, that by defining the opportunity milestones and weighting their values, translates into consistent sales process execution. While there is great value in using CRM systems, there are two problems which undercut their impact. First, most sales processes are defined using business-specific criteria. These functional milestones include getting a signed non-discloser or conducting a technical webinar. They're important, but don’t force salespeople to accomplish nor defend whether they've met critical sales-specific milestones. For example, has the prospect articulated the business need, not the application need, to the salesperson? 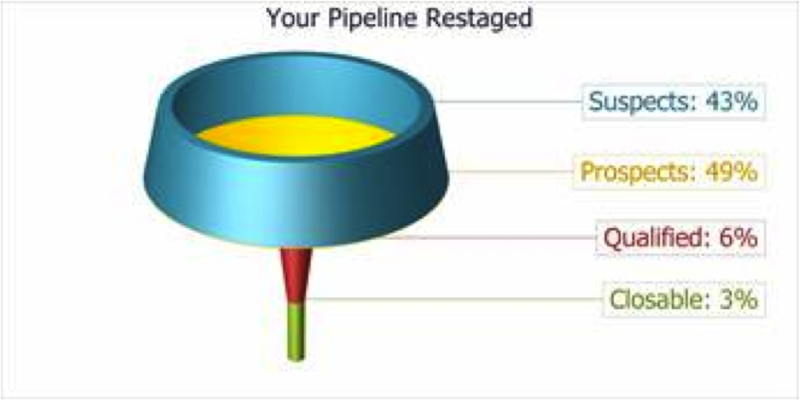 If your CRM system traps too many company milestones at the expense of sales process criteria, many opportunities, which are forecasted as "late stage" in your pipeline, are likely poorly-unqualified. To illustrate this, when we evaluate a sales organization, we have the salespeople report on proposal-ready opportunities. 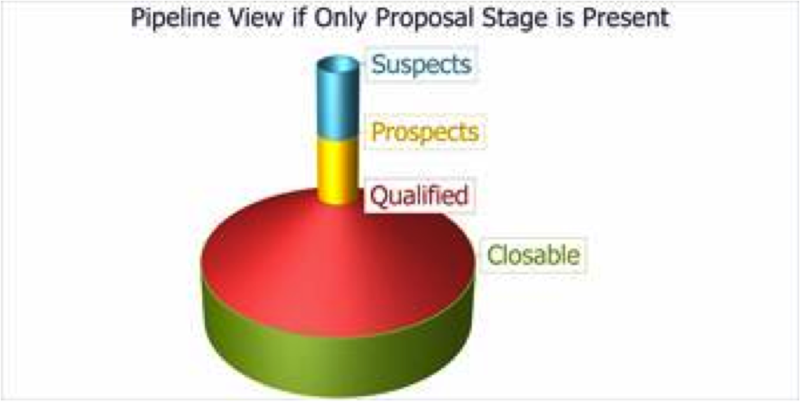 We ask them questions to determine if they are indeed proposal-ready. I challenge you to test this by asking your salespeople to describe the decision process and criteria, which decision-maker can squelch the deal and how they know that the prospect will leave their existing supplier. Ask them to describe the specific expectations for an upcoming meeting, why this is the strategy and what the prospect is expecting to happen - not what their plan is. The second problem with CRM systems and sales process is how sales leaders manage opportunities. They focus on the current month's “closable opportunities”. The result is a short-term, purely tactical approach, focused almost exclusively on how to close the deal. Process is pushed aside and, in many cases, the sales manager takes over. This results in sales process execution accountability and commitment becoming less important than revenue. Salespeople continue to execute the process steps improperly, get bailed out by their sales leaders, reinforce bad behavior and learn little. If other company departments, the challenges of inconsistent process adherence and/or execution makes it unlikely that change could come quickly. Why do companies and its leaders tolerate this? In many cases, they seem to encourage it. Are you committed to finding ways to address this challenge? 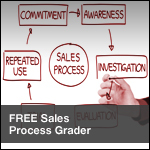 Take our sales process grader and see what you need to work on.